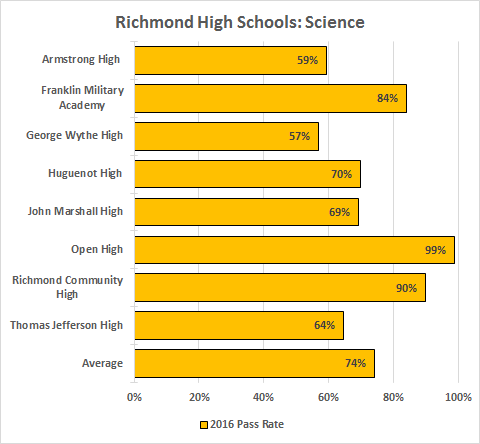 As to the state, that is true. 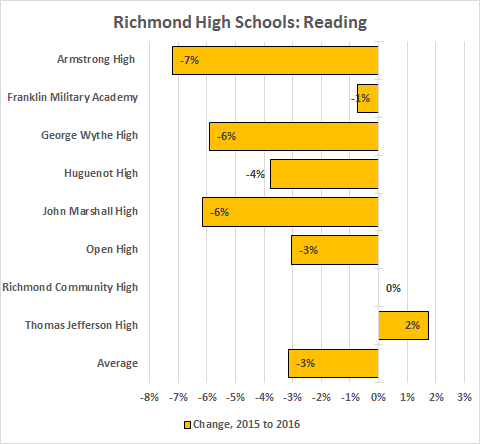 As to Richmond, not. 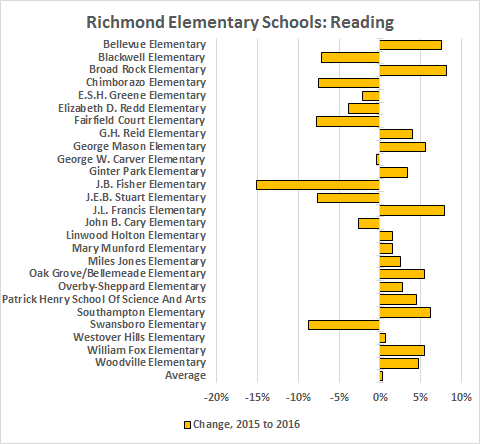 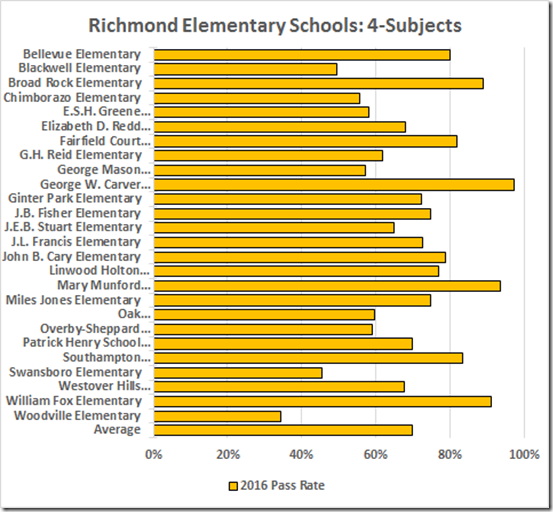 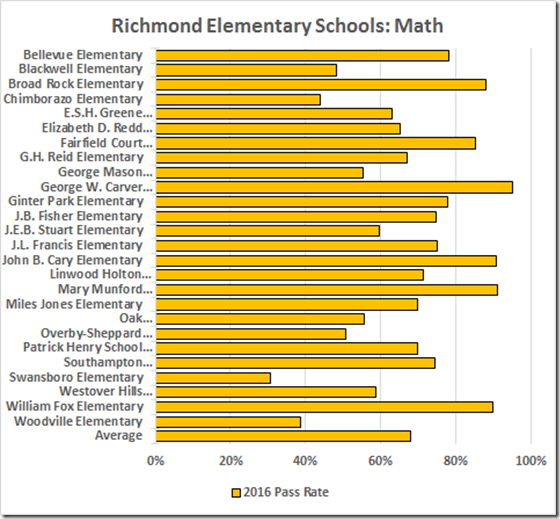 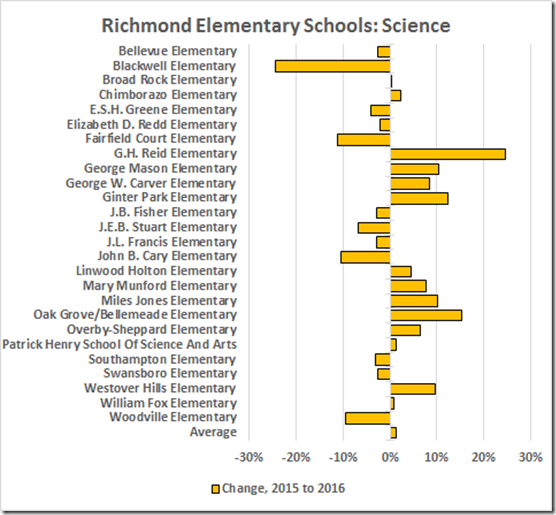 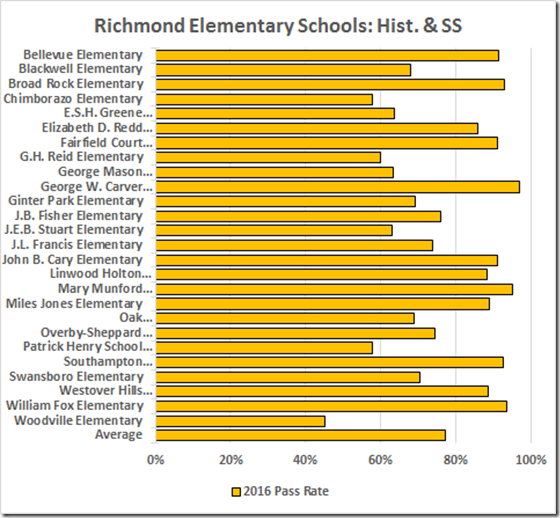 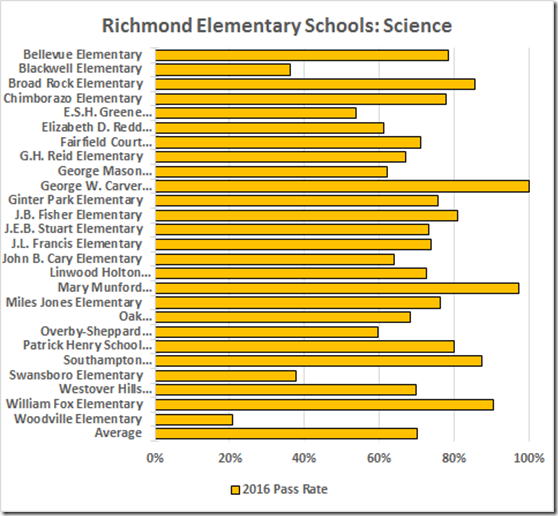 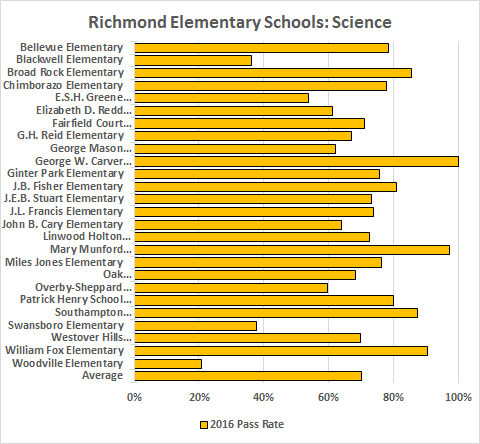 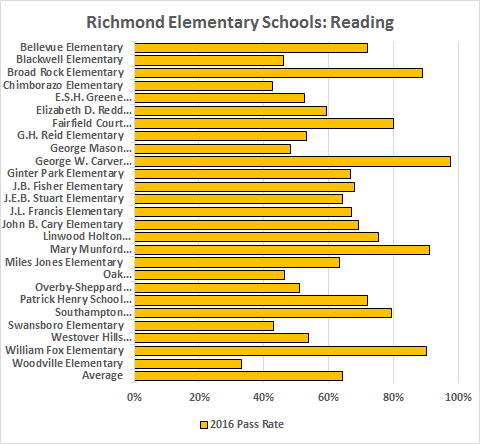 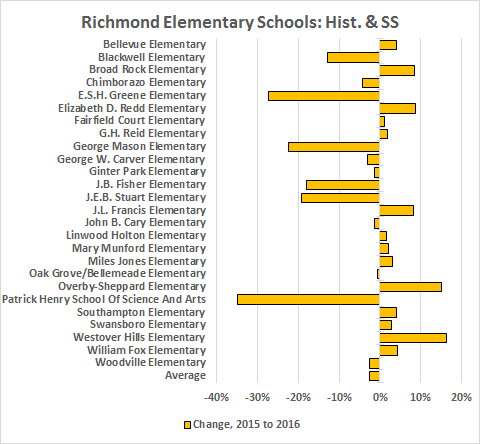 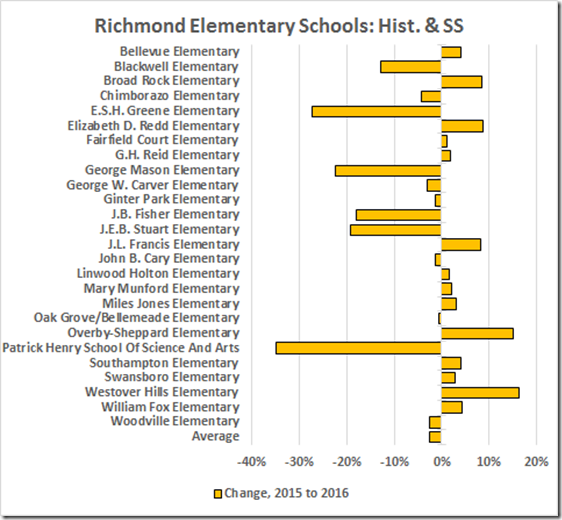 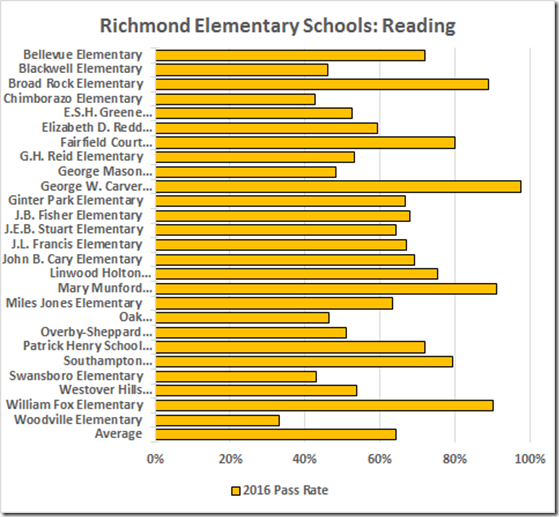 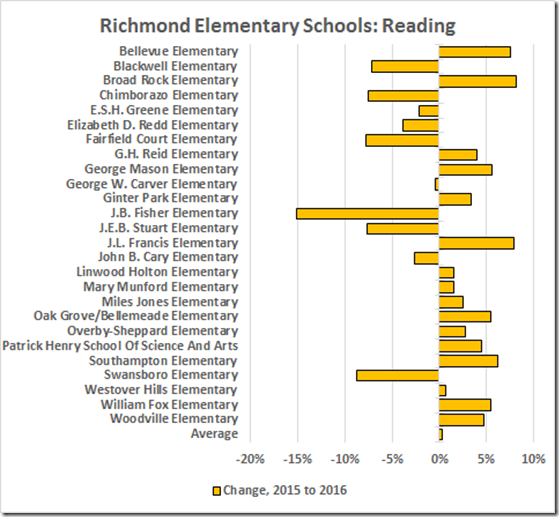 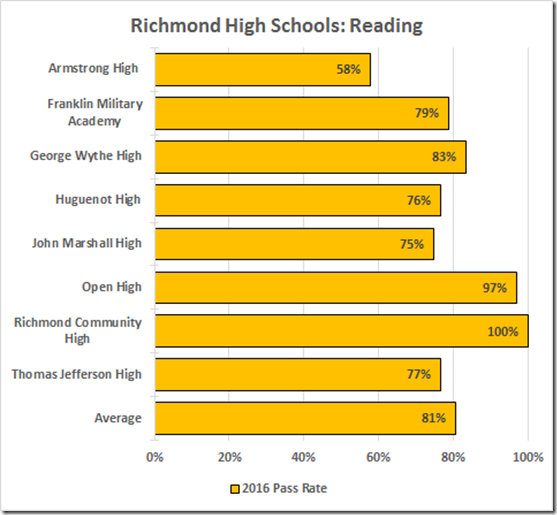 Let’s start with the reading subject area and Richmond’s elementary schools. 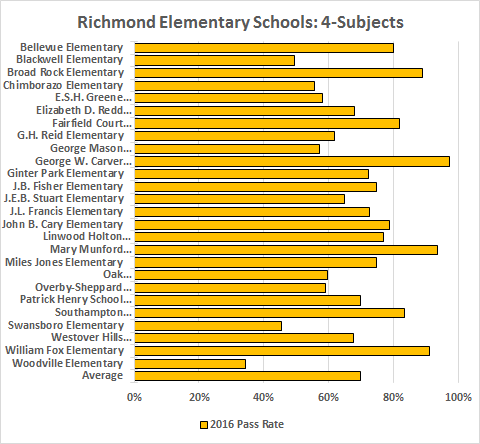 Here are the 2016 pass rates (note that 75%, after the “adjustments,”is passing for accreditation purposes). 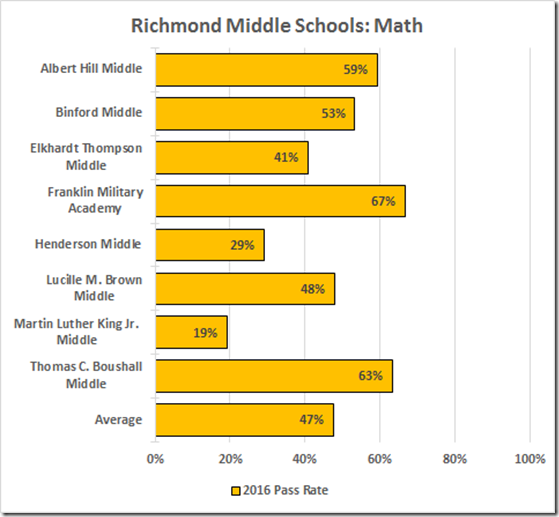 The 64.4% average is not encouraging. 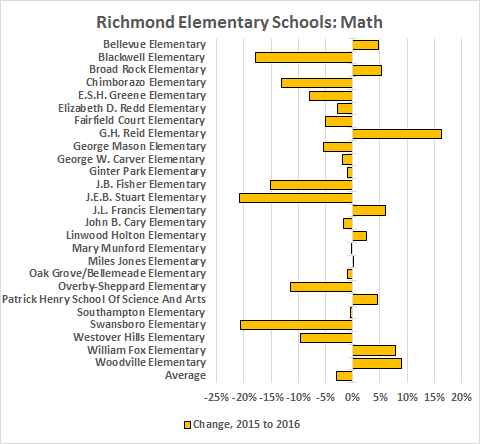 It improved from last year by 0.3%. 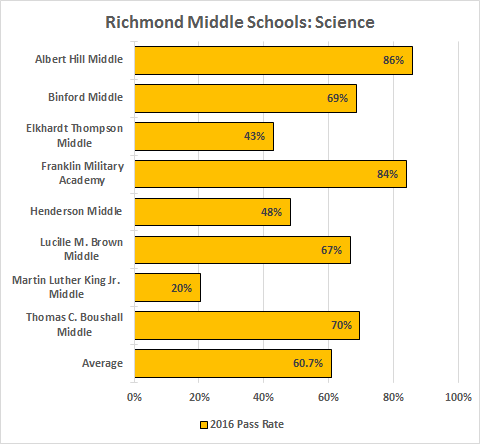 The accreditation benchmark for math, science, and history is 70%. 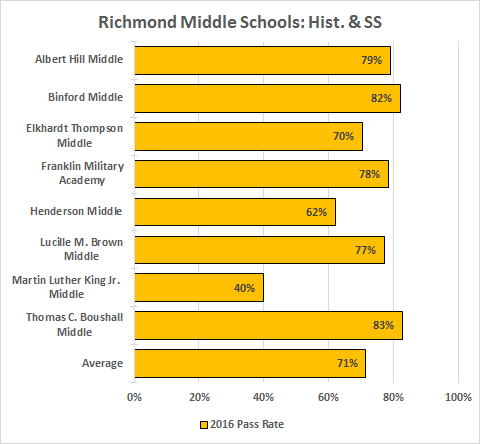 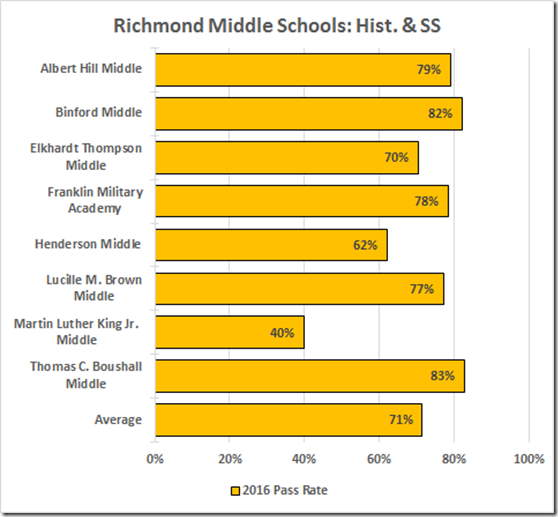 Our elementary schools’ History & Social Science pass rates showed a 77.2% average with a 2.5% decrease. 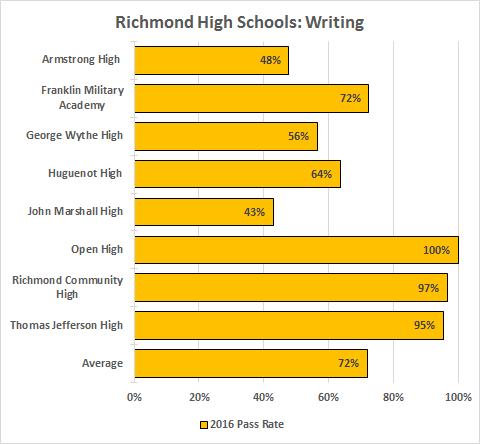 Patrick Henry was a particular disappointment here. 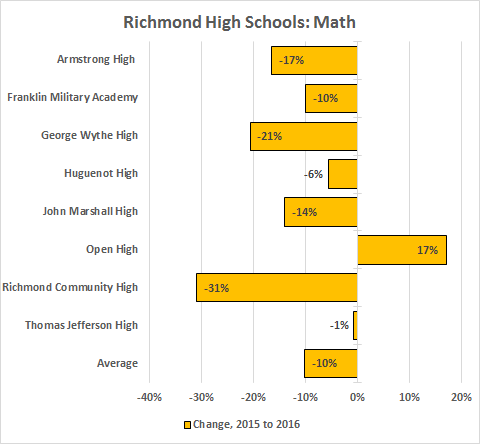 The math average of 68% was a 3.0% decrease from 2015. 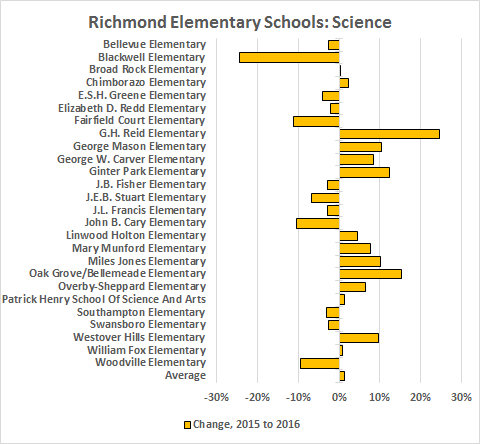 The elementary schools averaged 70% for the science subject area, up 1.2% from 2015. 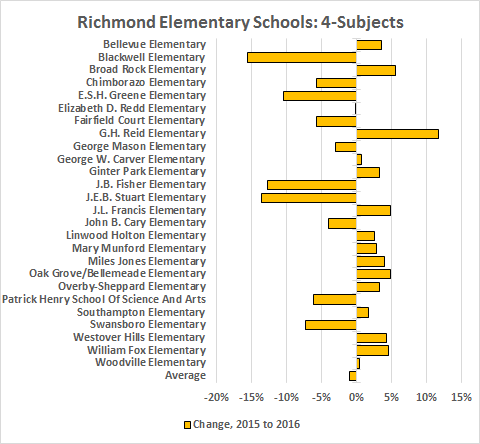 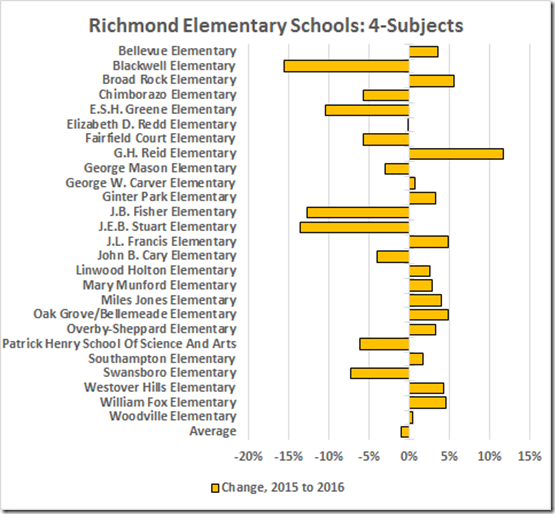 The four subject average for our elementary schools was 69.9, down 1.0% from 2015. Carver, with a tough clientele, continues to shine. 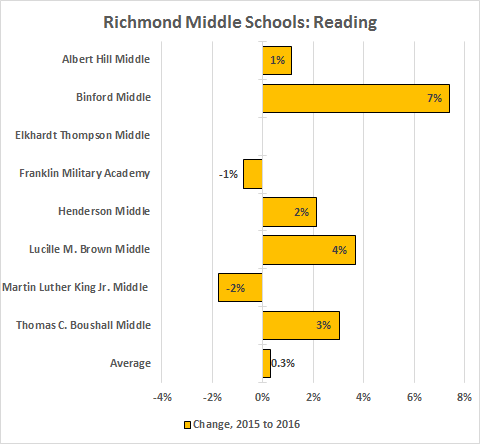 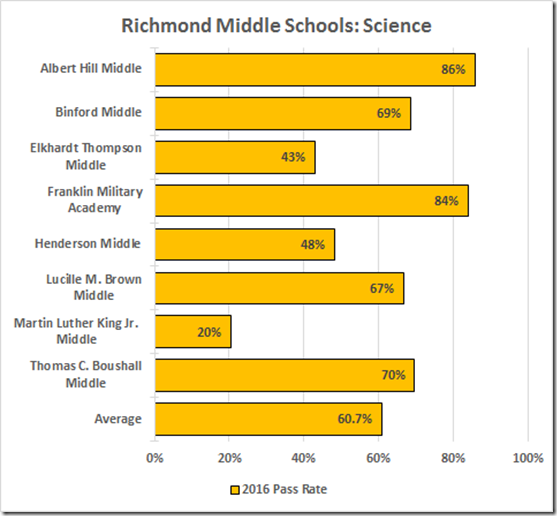 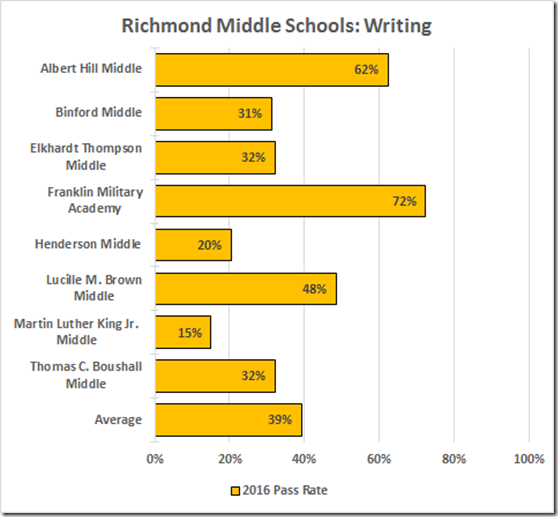 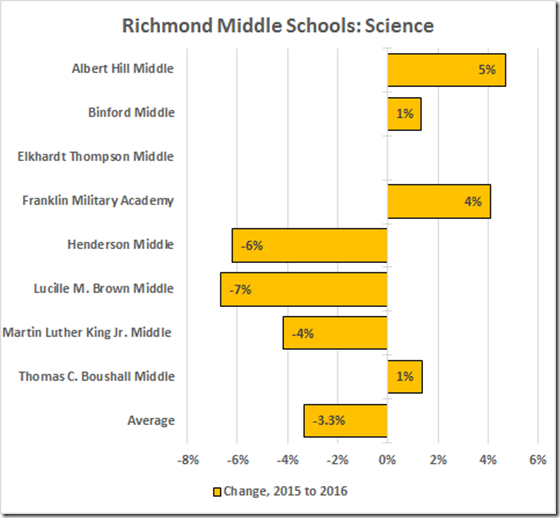 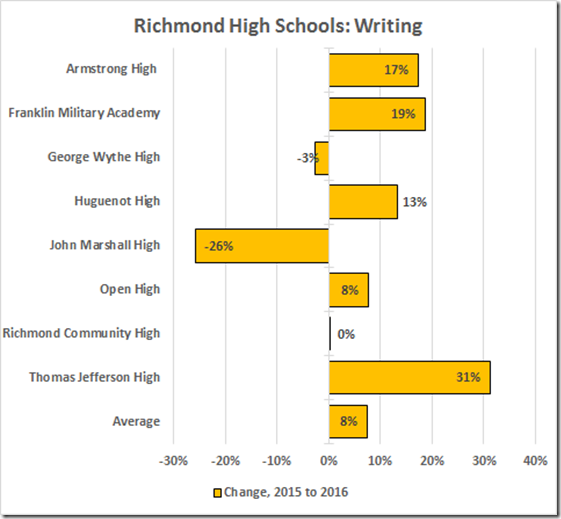 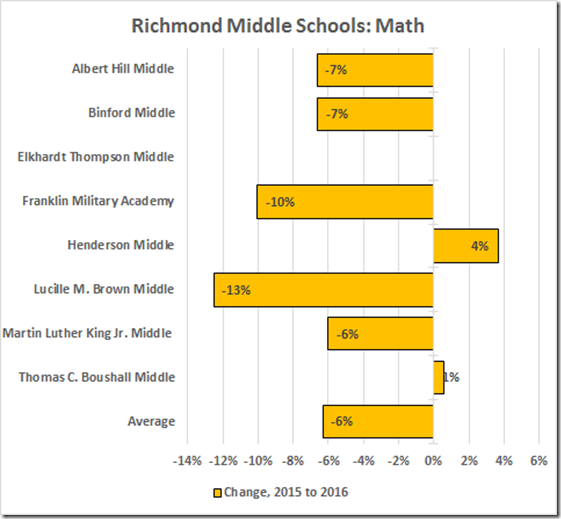 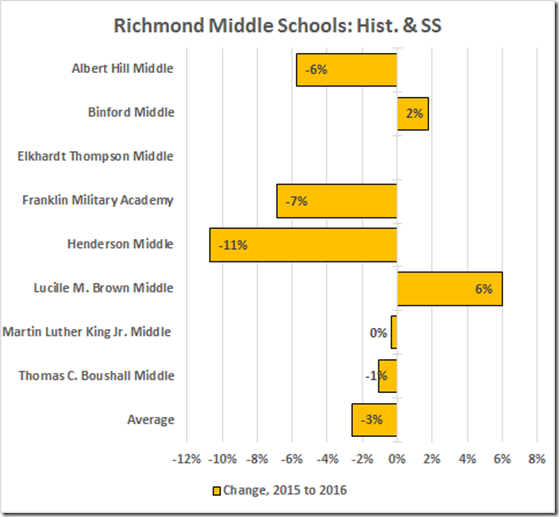 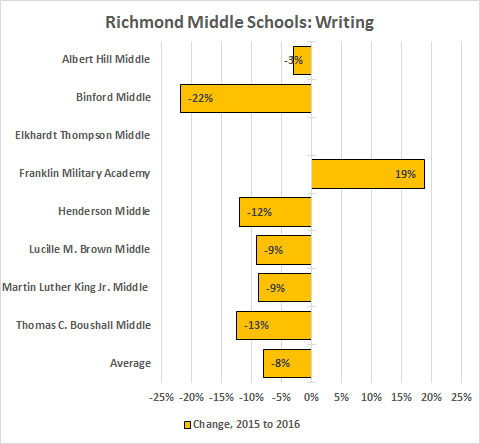 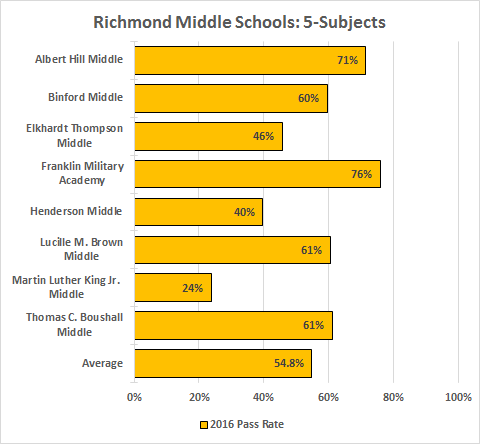 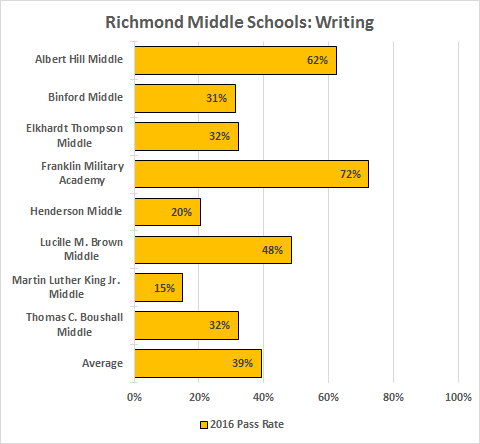 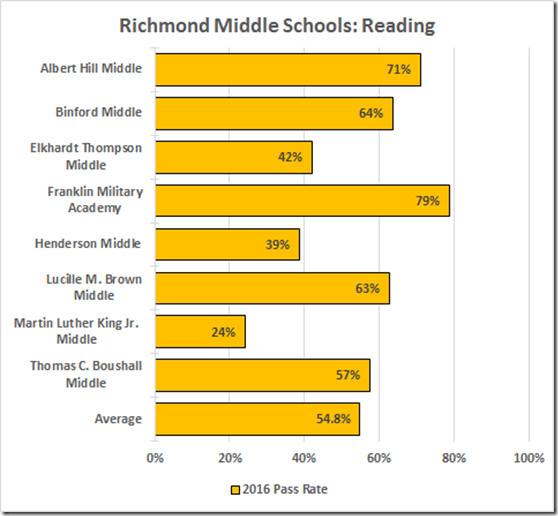 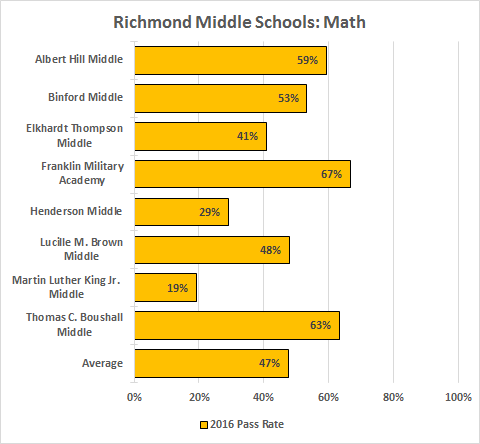 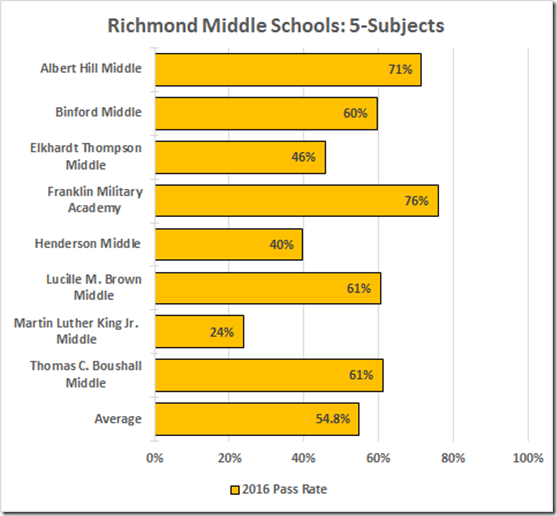 Our lousy middle schools turned in another awful reading performance, averaging 54.8%, an increase of 0.3% from 2015. 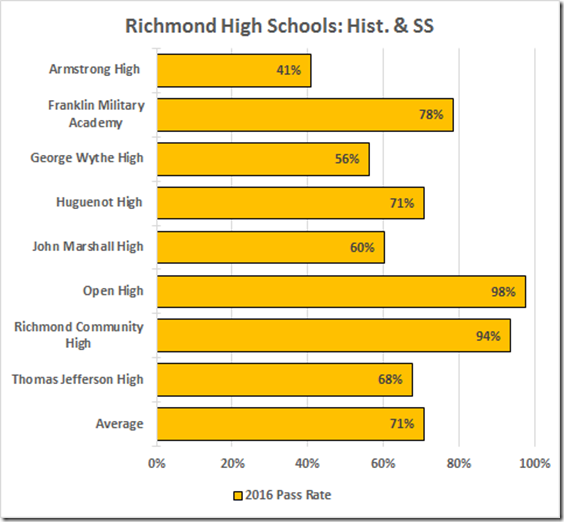 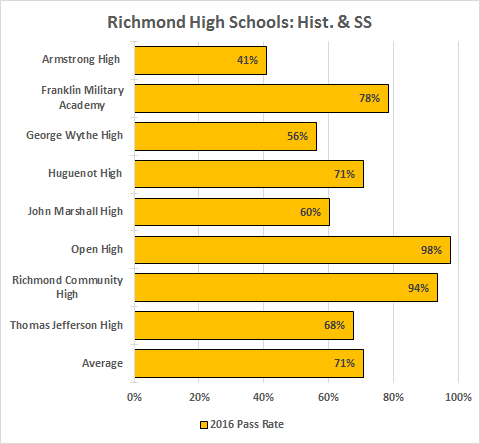 Notes: Franklin Military has both middle and high school grades; I’ve included it in both the middle and high school datasets although the pass rates do not compare directly with either the middle or high schools. 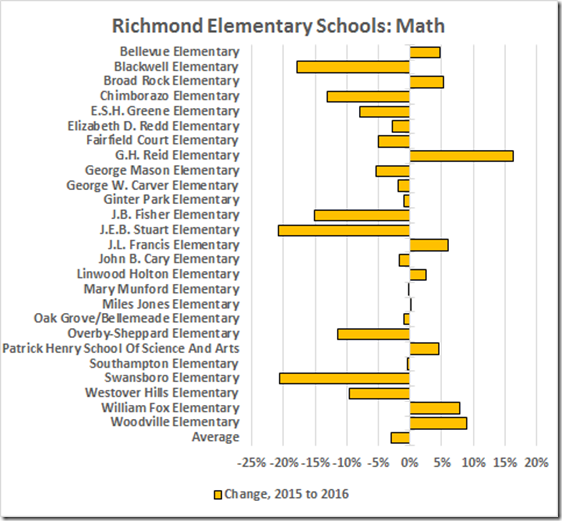 2016 is the first year for Elkhardt-Thompson so there are no year-to-year data. The writing average was an appalling 39.3, down 8% from 2015. 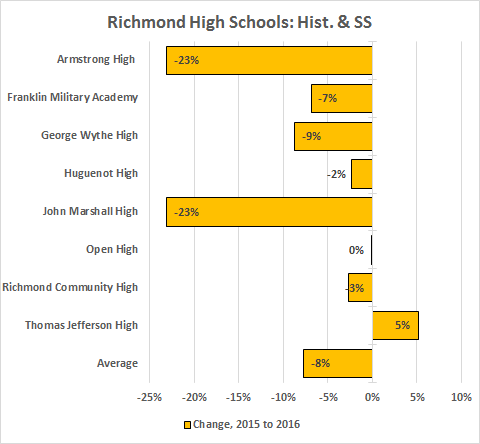 History & Social Science looks a lot better, but shows a 2.6% decrease. 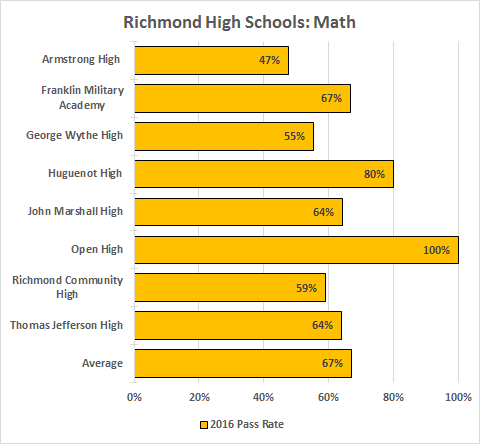 The math pass rate plunged 6.3% to 47.5%. 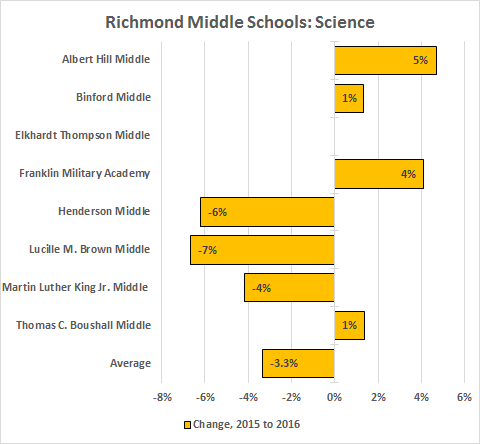 Science dropped 3.3% to 60.7. 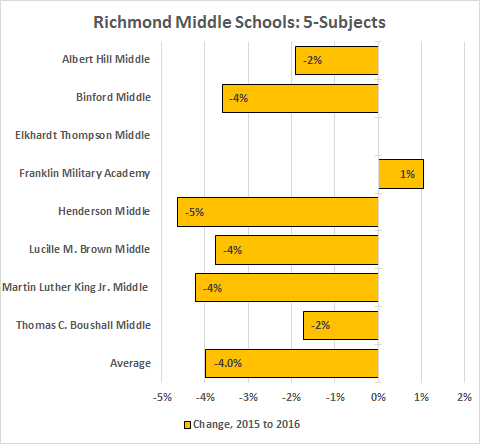 The middle school five subject average dropped 4.0% to 54.8%. 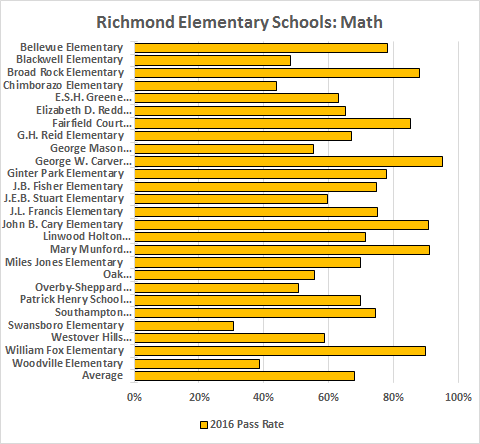 As to Elkhardt-Thompson, here are the 2015 data for the separate schools and the 2016 rates for the combined school. 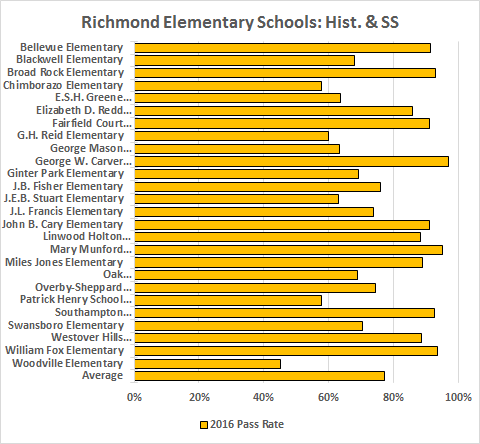 The History & SS scores came up a bit to passing; all the rest are and were variously awful. 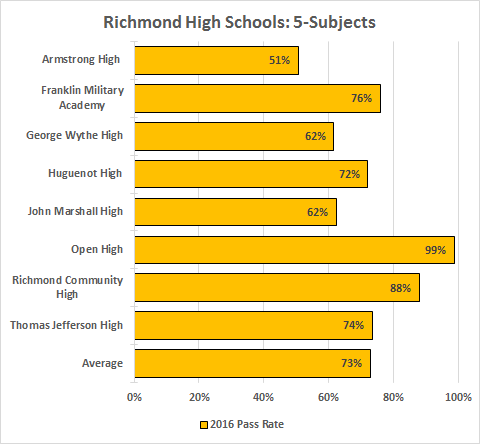 The high schools posted a mixed group of pass rates with an average drop of 3.9% to a 72.8% average. 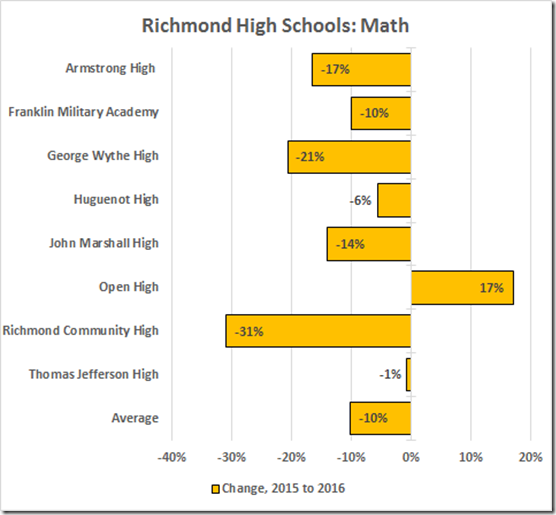 Looks like ongoing problems at Armstrong, Marshall, and Wythe. 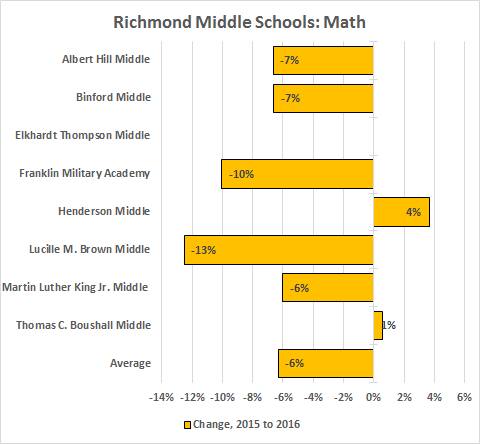 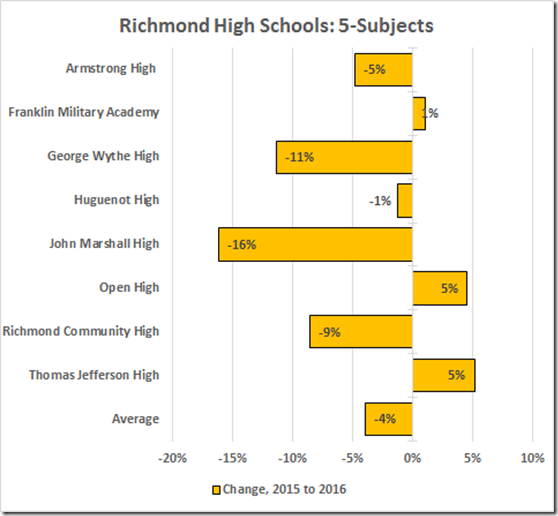 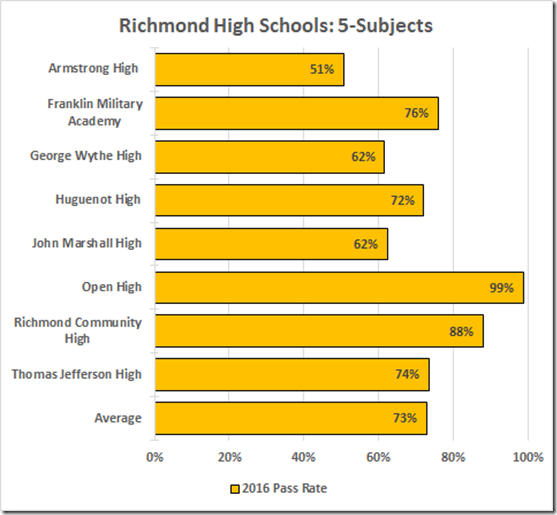 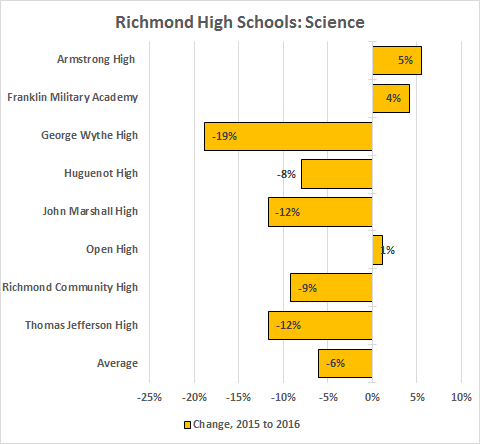 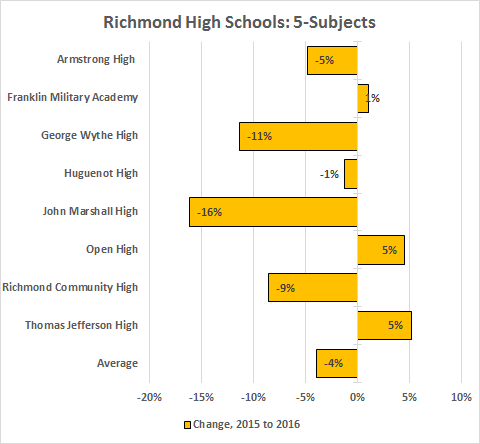 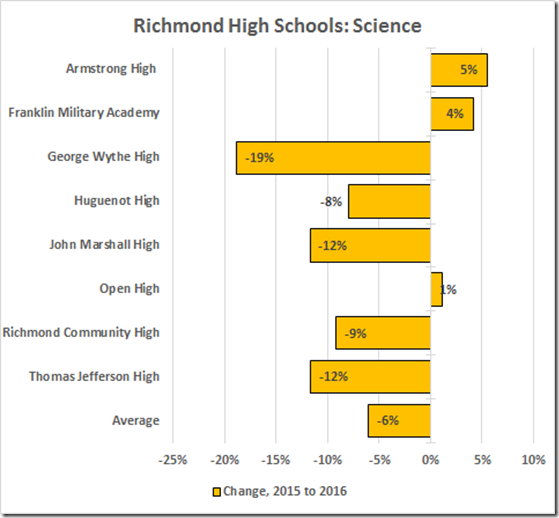 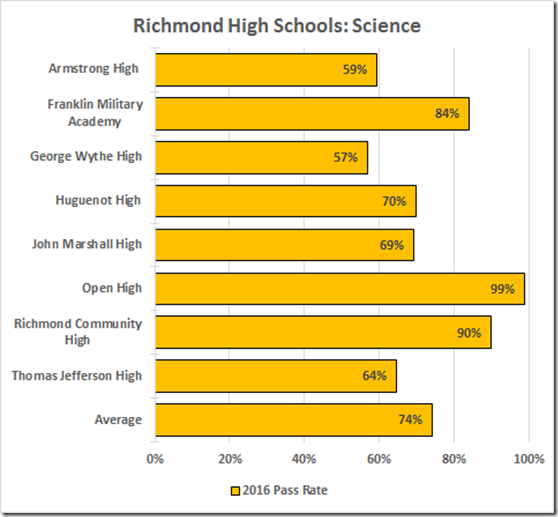 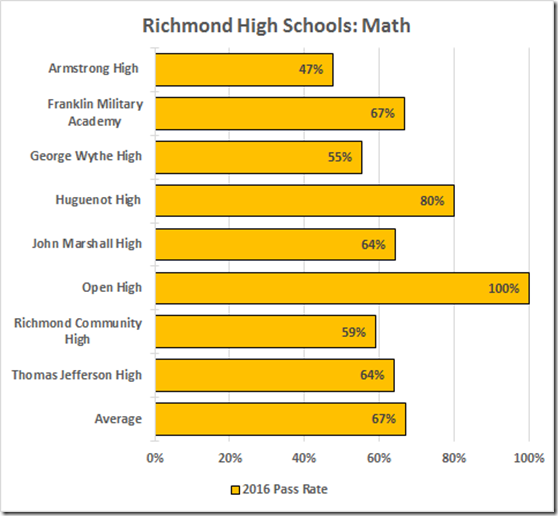 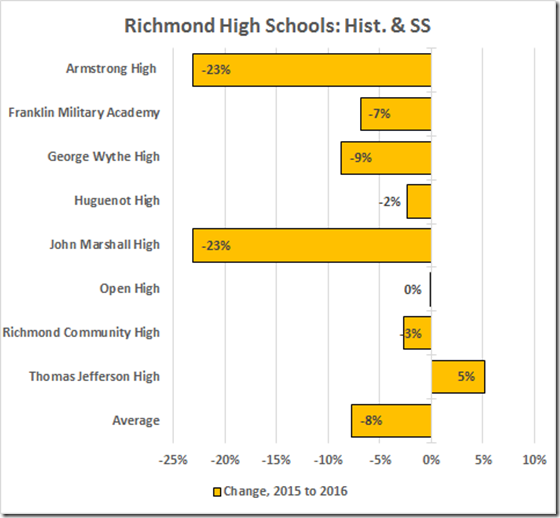 Overall, these data reflect a frightful incompetence of our School Board and Superintendent.